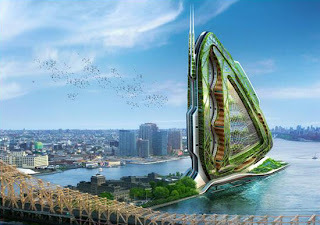 Revolution Greens: Vertical Farms: Wave of the Future? More and more people are moving to downtown/urban centers. It is expected that in the next 40 years 80% of the population will live in an urban area. When the Revolution Greens team found this startling stat we began to wonder about the future of food. Would it be possible for these new city dwellers to get locally grown, organic and sustainable food? Where would it come from? What land would be used? Well it looks like the answer could be Vertical Farming. A quick definition: Vertical farming is a proposal to conduct large scale agriculture in urban high rises or "farmscrapers". Using recycled resources and greenhouse methods such as hydroponics, these buildings would produce fruit, vegetables, edible mushrooms and algae year-round. Vertical Farming has started successfully on a very small scale in some cities with the advent of green roofs. The question now is, Will we make take the leap and make this dream a reality?